We've all been there: You make last minute plans to have friends come by after work. Great! Then you realize you have nothing acceptable to serve. You make a mental list of over a dozen things to pick up at the market on the way home, and feel stressed because there isn't one market with everything you need and you're running late as it is. This scenario can be avoided with some really easy preparation that I like to call pantry prep. By stocking up on a few staples, you can cut your last minute market list down to the fresh flowers that you usually don't have time to buy. And then you can relax and enjoy your company. I guarantee that once you've removed the anxiety that tends to come along with last minute hosting, you'll begin to host more frequently and enjoy it even more. The items below are helpful in putting together a spread of small plates. We'll get to sweets and beverages another time! 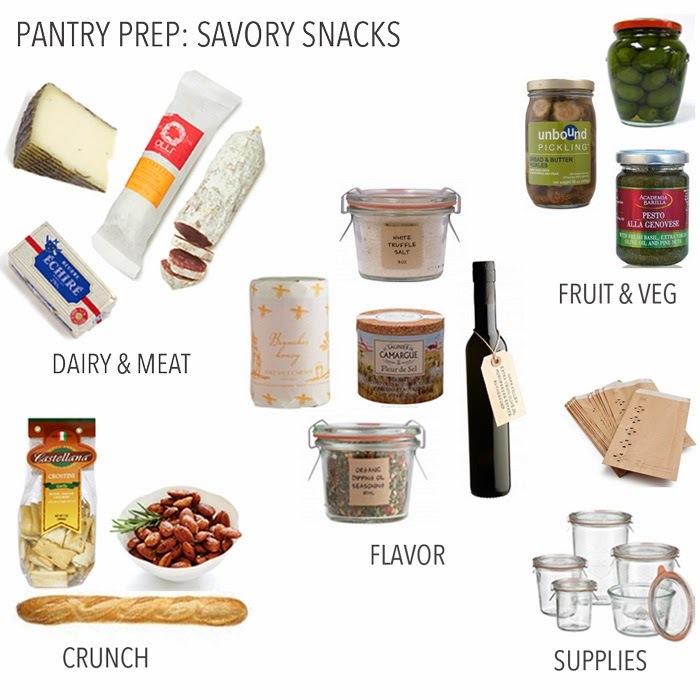 Weck jars are airtight and the perfect way to store food in your pantry, fridge or freezer. Crate & Barrel and West Elm Market have a variety of sizes available at reasonable prices. Picking up a few at a time is also a good way to rid your kitchen of the harmful BPA's found in plastic. Formaticum cheese storage papers and bags extend the life of cheese. Did you know that you should never wrap cheese in plastic wrap? It suffocates the cheese and causes the flavor to suffer. I like to try new cheeses at the farmers market and choose one to bring home, but classics like Manchego and Brie are always crowd pleasers and good to have on hand. Have you tried a high quality French butter? The difference between this and regular butter has changed my world. You can simply spread it on bread or crostini with some sea salt sprinkled on top, or mix in dried herbs to make a spread. There are dairies in Vermont like Vermont Creamery that make butters of similar quality if you'd like to stay more local. Disclaimer: I am a vegetarian. But Olli Salumeria's organic meat products are responsibly made, and (I'm told) delicious. I keep a jar of cerignola olives on hand in case I don't have time to stop by an olive bar. I think the simplicity of a plain, unpitted, unstuffed olive makes for the freshest tasting jarred option. The next time you're at a gourmet market, pick up a container of small batch pesto. Pesto can be frozen beautifully for use anytime within a year and is the perfect spread for a last minute bruchetta. Pickles have had quite the foodie comeback, with artisanal versions popping up everywhere. My favorite type is the bread & butter pickle because they're small and easy to serve during cocktail hour. Invest in a finishing salt. I love Le Saunier De Camargue Fleur De Sel, and Maldon Salt is a solid, less expensive option. For added flavor, I use St. Helena Olive Oil Company's white truffle salt. I miss the black truffle salt, which has been discontinued, so learn from my mistake - when you find an artisanal product you love, stock up! St. Helena Olive Oil Company makes several other items that I consider must-haves: their spice mixes can be used for cooking or just sprinkled into a bowl of their olive oil as a dipping sauce for bread, or blended into your French butter. Katz, another Napa based company, makes wonderful flavored honeys that are perfect to pair with cheese. This is perhaps the easiest part of pantry prep. I love crostini as an alternative to crackers and always have a large Weck jar full of them. I like Castellana's rosemary version, which can be found in most normal grocery stores. When you happen upon some fresh baguettes, do yourself a favor and bring home a few to freeze. If you triple-wrap them, baguettes are a great bread for freezing because of their small surface area and quick thawing time. You can then serve them fresh or toasted. Spiced nuts are a classic, and even better if you can spice and toast them yourself in advance (recipe for rosemary spiced almonds to come this week! ).